Today was quiz day in College-Prep. 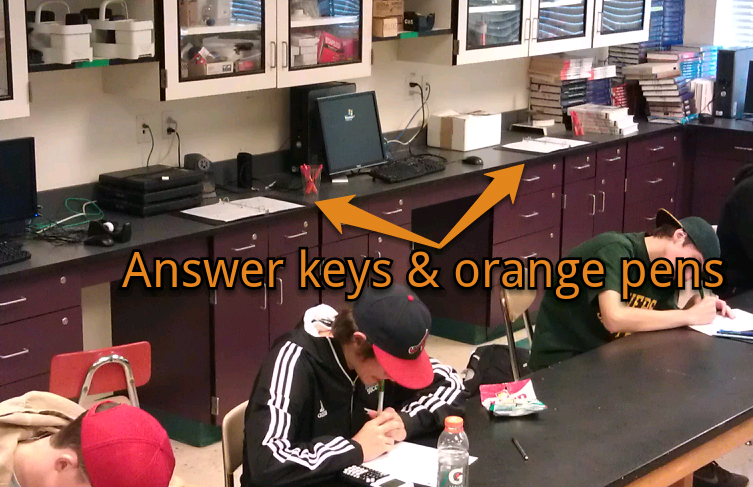 In an effort to give students more immediate and meaningful feedback, I set up stations with the answer key and orange pens on the counter around the room. When students were finished with the quiz, they brought their quiz to a station to check their work against the key and use the orange pens to leave themselves feedback directly on the quiz. Then they handed the quiz in to me. What I like about this: students give themselves the feedback they need and I get to see what that feedback looks like. Update – Why Orange Pens? There’s nothing special about orange. Back when I first tried this out, I required students to make color-coded diagrams and graphs on their quizzes (red = force and acceleration, blue = position, black = objects, green = velocity) which meant I couldn’t have kids use any of those colors for self-feedback. I have since stopped requiring color-coding on quizzes (though we still do it on whiteboards and notes). Now I’d probably use green pens for feedback — easy contrast with original work in blue/black ink or pencil AND easy to buy in bulk. Update 2013-10-25: Because of the way my classes are scheduled this year, I’m not setting up the answer keys in the back. Students take the quiz one day, then the next day and we go over the quiz on the overhead. Not totally efficient, but better than nothing. It also addresses some fears about potential cheating between students in different periods (e.g., a student in period 1 sees the answer key and then tells a student in period 9 what the answers are). Frank,This is a great idea. I just tried it for myself, and I think I’m going to shift my whole idea of post game analysis to take place right after the assessment. Much better for student learning. Thanks for the tip. This is clever. When I do short quizzes I have the students exchange papers and grade each others. We go over the answers as a class, but like you said, it is inefficient because we always have to wait until everyone is done. This gives the faster/more eager students a chance to get their quizzes graded so they can move on to the activity of the day. like it. Another new thing to try. I love the idea and I tried it out with my students today, but it brought about a Standards Based Grading question. After the post game analysis, I instructed students to go back and try again at a correct solution (the topic was integer operations). After re-grading the quizzes, several students were successful the second time around…(how) do I give them credit for their success the second time around? Found this pot via Jason’s blog. I’d love to hear your feedback on an idea I’m working on for feedback on a math assessment. If you have a moment to read my most recent post, I’m curious to hear your thoughts. Thanks! I’m trying this tomorrow with purple pens and with a substitute teacher in the room. I’m giving instructions on the quiz for the procedure. I’ll be able to collect the quizzes at the end of the day when I return to the building from a field trip. I hope the kids find it helpful! mthman,Sounds like you would record the new score beside the old one. Do you only count the most recent score? Average them?